For the second time this year, Washington C.H. Municipal Court Judge Victor Pontious will be challenged in an election. After winning the Republican primary election over Susan Wollscheid, Pontious will now face off against Steve Eckstein, former Fayette County Prosecutor, in the Nov. 7 general election. Pontious, Eckstein and all other candidates who will be on the November ballot were certified Monday by the Fayette County Board of Elections. In the Miami Trace Local School District, three incumbents – Mike Henry, David Miller and Rob Dawson – will return to the school board for another term. Besides those three, no one else filed to run for Miami Trace school board. – Four members need to be elected to the Jeffersonville Village Council but only two were certified: incumbents Dawn Casteel and Roger Spahr. Following the election, the village council must appoint two more members to fill the openings. – In Bloomingburg, four incumbents – Carol Cramer, Tim Bennett, Jerry Fleak and Dorinda Brown-Oates – will return for another term as they are the only four who will appear on the ballot. – Although there are four slots available on the Milledgeville Village Council, no candidate filed. Also, no candidates were certified to the ballot for Octa Village Council, where there were also four to elect. – Incumbents Ted Waddle and James Garland will serve another term as Concord Township Trustees. – Incumbents James Worley and Ryan Corzatt will serve another term as Green Township Trustees. – In Jasper Township, two will be elected from the following three candidates: incumbents Glenn Rankin and Jackie Pursley, and newcomer Chessie Ratliff. – Incumbents Ryan Yenger and Jeffrey Hoppes will serve another term as Jefferson Township Trustees. – Incumbents John Melvin and Michael Miller will serve another term as Madison Township Trustees. – Incumbents Chris Cottrill and Cody Kirkpatrick will serve another term as Marion Township Trustees. – Incumbents Scott Cook and Kenneth Kelly will serve another term as Paint Township Trustees. – Incumbents Heath Smith and Tommy Creachbaum will serve another term as Perry Township Trustees. – Brenda Hughes, who was recently appointed to the position, is the only candidate for Perry Township Fiscal Officer. – In Union Township, current trustee David Edwards is not seeking another term as township trustee. Only two will be elected as Union Township Trustees and only are two are running: incumbent Wes Wilson and Maurus Molloy. – In Wayne Township, current trustees Marie Fetters and Ron Weade are not seeking another term. Two will be elected as Wayne Township Trustees from the following three candidates: Kyle Hoppes, Jarrod Posey and Bob Redman. The Perry Township Trustees recently appointed Brenda (Hoppes) Hughes as the fiscal officer for Perry Township to fulfill the remaining term of Howard (Hap) Smith, who passed away unexpectedly. 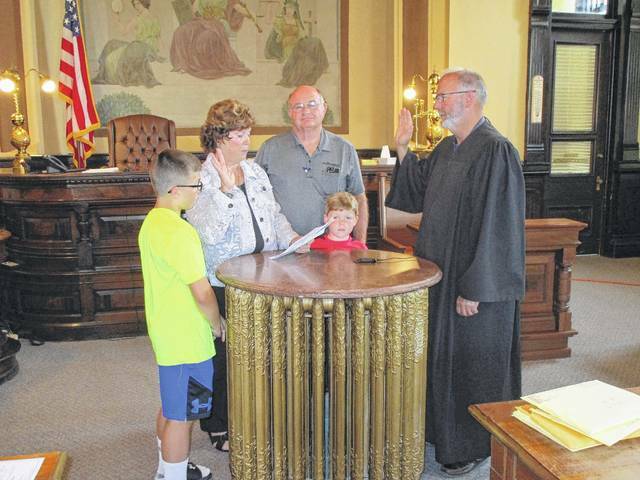 Hughes was sworn in by Judge Steven Beathard on June 30 at the Fayette County Court House. Along with Hughes is her husband, Max, and two of her five grandchildren, Drake and Drew Sharp. Mr. and Mrs. Hughes live, own and operate a grain farm in southern Fayette County and are Perry Township residents. Perry Township residents will see Brenda Hughes’ name on the general election ballot this November. https://www.recordherald.com/wp-content/uploads/sites/27/2017/08/web1_IMG_0180.jpgThe Perry Township Trustees recently appointed Brenda (Hoppes) Hughes as the fiscal officer for Perry Township to fulfill the remaining term of Howard (Hap) Smith, who passed away unexpectedly. Hughes was sworn in by Judge Steven Beathard on June 30 at the Fayette County Court House. Along with Hughes is her husband, Max, and two of her five grandchildren, Drake and Drew Sharp. Mr. and Mrs. Hughes live, own and operate a grain farm in southern Fayette County and are Perry Township residents. Perry Township residents will see Brenda Hughes’ name on the general election ballot this November.